Home » Flavours Blog » Happy Republic Day! The patriotic event is a great chance to celebrate Italy’s armed forces as members of the Army, Air Force and Navy take part. 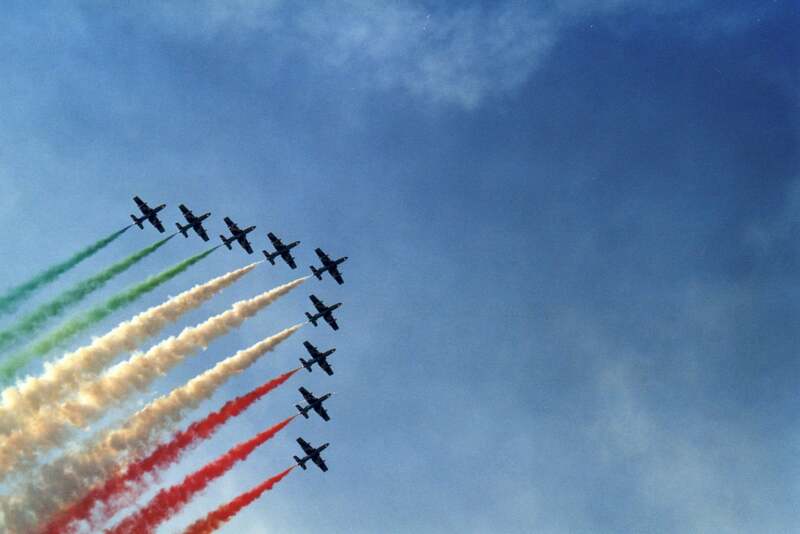 Perhaps the most impressive sight of the day is the Italian flag being painted across the sky by the Frecce Tricolori (The Tricolour Arrows), the Air Force’s aerobatic display team. Many museums remain open, especially in the afternoon once the 11am parade is finished. Those in Rome benefit from the Quirinale Palace gardens being opened up for free. In the US, expat Italians and families proud of their heritage mark the occasion with special dinners. As far away as Australia, Republic day is extended to a full week in the state of Queensland, with events celebrating all aspects of Italian life – food, wine, inventions, famous artists and the language. The city of Brisbane even illuminates their main road bridge in italian tricolore on Republic Day to celebrate. If you want to find our more about authentic Italy and its culture on one of our solo holidays then check our 2015 brochure here. We charge no single supplement – so whether you choose to taste the true Italian flavours on our cookery holidays or to capture the stunning scenery on a painting holiday or simply take a relaxing break for body and mind on our Pilates retreats – a Flavours holiday will be truly inspiring! Contact us today to find out more.